Marine debris is a global environmental problem especially apparent on small islands throughout the world. We implemented an educational outreach program to engage primary and secondary students in the scientific process using the tangible issue of marine debris on a typical small island in Indonesia (Barrang Lompo, Spermonde Islands, South Sulawesi). Over a 3-year period, students conducted systematic sampling of debris on their island's beaches. They quantified the enormity of the debris problem, discussed data, and compared experiences with partner schools in California. The program inspired a unique, local perspective on marine debris that includes greater awareness of human health impacts as well as a need for realistic solutions to this problem faced by small islands. Marine debris is ubiquitous in the rapidly developing and vastly diverse nation of Indonesia. Much of the nation's waste makes its way onto the numerous islands and ocean areas that make up the archipelago (Evans et al., 1995; Uneputty and Evans, 1997; Willoughby et al., 1997) as a result of limited infrastructure for waste management (Supriyadi et al., 2000; Jambeck et al., 2015). Marine debris is any anthropogenic, manufactured, or processed solid material discarded in the marine environment directly or indirectly from activities on land and at sea (UNEP/NOAA, 2012). The negative impacts of marine debris, particularly plastics, on wildlife and ecosystems are well-documented (Derraik, 2002; Thompson et al., 2009; Gall and Thompson, 2015). Marine debris also affects livelihoods, such as fisheries (Nash, 1992; McIlgorm et al., 2008), and public health, such as ingestion of pollutants indirectly through consumption of fishes that consume debris (Rochman et al., 2015). Despite a national task force to address marine debris in Indonesia (Gerakan Bersih Pantai Laut), little progress has been made; lack of political will, complex geography, competing socioeconomic priorities, and minimal coordination between agencies and communities results in few centralized policies to deal with marine debris (McIlgorm et al., 2008; UNEP, 2009). These impacts are particularly noticeable across small islands that are often neglected and socioeconomically limited (Glaeser and Glaser, 2010; Farhan and Lim, 2011). Educational outreach regarding the impacts of marine debris can be a low cost and effective means of addressing marine debris issues on local and regional scales (McIlgorm et al., 2008; UNEP/NOAA, 2012), especially as debris often originates from both local and distant sources (Hardesty et al., 2015). However, marine debris in Indonesia is largely unmonitored beyond sporadic events and there are few large-scale public outreach initiatives (Evans et al., 1995; Uneputty et al., 1998; but see www.projectaware.org, www.trashhero.org). Raising awareness can motivate on-the-ground community action (Chandler et al., 2012; Crabbe, 2012), and addressing relevant, tangible environmental issues is also a means to engage students in science education (Hudson, 2001; Chawla and Cushing, 2007). We aimed to raise awareness of the impacts and scale of marine debris and to expose kindergarten through grade 12 (hereafter, “K-12”) students to the scientific method through an educational outreach program partnering universities [Hasanuddin University (UNHAS), University of California, Davis] and K-12 schools. We adapted our program from California (http://bml.ucdavis.edu/education/cameos/) and implemented the program with students at the UNHAS marine station. The UNHAS marine station is located on the island of Barrang Lompo, 12 km from the city of Makassar and part of the Spermonde Islands in South Sulawesi. Barrang Lompo represents a typical inhabited Indonesian small island, with an area of ~21 hectares and a population of roughly 5,000 people (BPS Indonesia). Marine debris overwhelms the shorelines of Barrang Lompo (Figure 1A) and many of the populated islands in the Spermondes since there is little waste management infrastructure and few technical solutions. Figure 1. (A) Marine debris covers the shoreline at Barrang Lompo. (B) K-12 students sort and measure debris at the UNHAS research station. Informed consent was obtained from the parents/legal guardians of the depicted individuals for the publication of this image. All necessary permissions have been obtained by the University of California. Our K-12 outreach at Barrang Lompo progressed from an introduction to the ecological impacts of marine debris, to systematic sampling of the types and amounts of debris along nearby beaches, to graphing and presenting the results of the surveys. Our group of marine science graduate students and faculty from both universities conducted 1-day events two times per year from 2013 to 2016 (six events total), which reached an average of 61 K-12 students per visit. K-12 students collected debris from two 1 m2 plots along a 10 m transect at three locations around the island and categorized and measured items for approximate volume (Figure 1B). After the K-12 students mastered the sampling protocol, they advanced to calculating percentages of each type of debris, discussing their results and possible solutions, and comparing to past survey dates and to debris data from the partner outreach program in northern California. By quantifying the volume and the types of debris collected, the outreach stimulated discussions by participants about ways to reduce and reuse plastic items. The mean volume over all sampling dates was 0.065 cubic meters per square meter (n = 6, s.e. = 0.01), which equates to almost knee high levels of debris along the shoreline; the volume alone is crucial to consider given the limited space for waste disposal on a small island. Debris items were largely from residential sources—construction materials (tarps, tiles, and wood), discarded clothing, and plastic trash from everyday items, such as plastic bottles and bags (Figure 2). Other plastic came from a range of items such as food, soap, or shampoos packaged as single use products, another consequence of the limited resources available for the small island. Understandingly, participants focused on individual and private actions to address the marine debris issue. The outreach also initiated community level discussions about solutions like burying tarps or burning clothes, motivated the opening of a recycling center and a women's collective to create goods out of plastic debris, and garnered interest from local and international NGOs. It is an especially hopeful sign that many of the students voluntarily returned to participate in every debris census over the years. Figure 2. 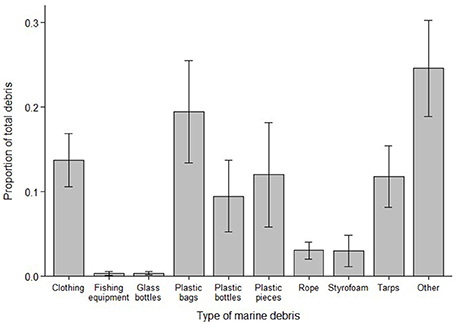 Proportion of marine debris types found at Barrang Lompo. Bars represent means ±1 SE. See text for description of “other” categories. The volume of plastic bottles highlighted the lack of adequate fresh drinking water as a fundamental problem (Ma et al., 2012), which results in reliance on plastic water bottles that often become marine debris. Desalination facilities on small islands would help solve this problem, but as we have seen firsthand in the Spermondes, facilities may fail due to lack of technical skills on the island, insufficient funding, or social conflict. Additionally, the recycling center on Barrang Lompo quickly shut down when the price of plastic dropped, as it was no longer cost effective for the community to ship recyclables back to Makassar; economic and technical limitations are common hurdles to manage debris across Indonesia and other developing countries (McIlgorm et al., 2008; Macrae, 2012; Abarca et al., 2013). Trash banks and recycling programs on Barrang Lompo and nearby islands in the Spermondes are independent efforts that depend on outside support, even if initially sponsored by government programs. Educational outreach to young generations may be a highly effective means of driving cultural change and bringing more attention to the issue within communities (Ballantyne et al., 2001; Chawla and Cushing, 2007). However, efforts must also be made beyond local levels to solve global environmental challenges of this magnitude (Kimball, 2001; UNEP, 2009; UNEP/NOAA, 2012). Communities trying to manage debris may feel powerless due to the immense scale of the problem (Chawla and Cushing, 2007) and can become discouraged when debris comes from elsewhere (Uneputty et al., 1998). Addressing the technical, economic, and infrastructural limitations for marine debris require multi-level government support that is further complicated by the difficulties of financing waste management and managing social and political components (Macrae, 2012; Abarca et al., 2013). Although there have been recent small-scale efforts by the Makassar city government, such as the mayor's campaign to clean up Makassar (Makassar Tidak Rantasa, Lihat Sampah Ambil), trash banks (Jakarta Post, 2016), increased focus on waste separation (Lestari Post, 2016), and managed disposal and pickup (Truk Angkutan Sampah Kita), it is not apparent that these efforts have reached Barrang Lompo nor how it has affected debris flowing from the city to the Spermonde Islands. There have been small initiatives in Indonesia, such as a government sponsored trial for a nationwide plastic bag fee (IDR 200, USD 0.06) in 23 major cities that quickly ended with the fee rescinded (Jakarta Post, 2016). These efforts can help increase awareness but still lack momentum as there aren't easily available alternatives or strong incentives (Gupta, 2011), and similar initiatives have yet to reach small villages or remote areas. We are aware of numerous small scale community cleanups and larger outreach campaigns throughout Indonesia (e.g., Trash Hero, Project Aware's Dive against Debris), but many of these cleanups are not systematic or do not incorporate structured K-12 science education. The larger, organized programs also tend to focus on high tourism areas (e.g., Bali, diving sites around Komodo National Park) unlike Barrang Lompo and other densely populated small islands swamped with debris but off the tourist radar. Managing marine debris on small islands will require diverse solutions. A very promising step forward is Indonesia's pledge to spend up to $1 billion a year to reduce marine debris by up to 70% within 8 years, through innovations in biodegradable materials, plastic bag taxes, and sustained public education (Economist World Ocean's Summit, Bali, Indonesia, February 2017). The focus on waste infrastructure, in addition to public outreach, is significant. Additionally, there should be more responsibility within the private sector to address the impacts of their packaged goods (McIlgorm et al., 2008), especially because packaging is the leading market for plastics (PlasticsEurope 2015). For example, we identified a range of companies on the labels of plastic debris found on Barrang Lompo, including large Indonesian corporations such as Garuda Food, Wings food, and Indofood, and large international corporations such as PepsiCo, Unilever, Nestle, and Johnson & Johnson. Applying public pressure to address the impacts of these corporations' products could be one part of a solution to reduce debris (Lyon and Maxwell, 2008). Notably, our experiences on Barrang Lompo also expanded our views on the human health impacts of marine debris, which may provide impetus for future action (Madajewicz et al., 2007). 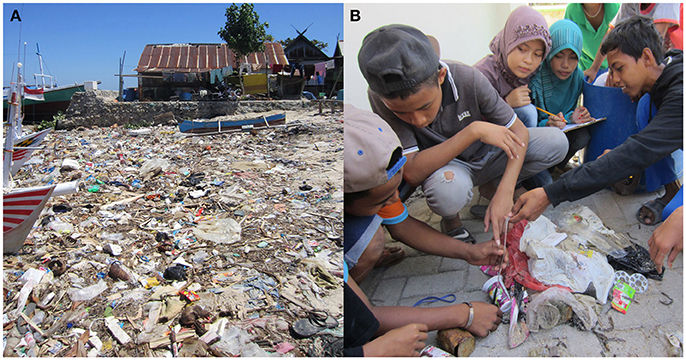 Plastic debris was found in fishes sold for human consumption in Makassar (Rochman et al., 2015) and used disposable diapers frequently showed up in our beach surveys (categorized as “other”). The residents on Barrang Lompo also expressed concerns that plastic debris traps water to create more mosquito breeding grounds, a particular concern for malaria (high incidences on other Spermonde Islands), dengue, and zika. Important next steps are to continue long term outreach programs in the Spermonde Islands and to strengthen the various marine debris initiatives across Indonesia. These marine debris initiatives could contribute to worldwide marine debris monitoring with standardized methods (e.g., counting or weighing items) and increased data quality control, but this will require more resources and time from scientists and communities than are currently available. In our experience, the vast amount of debris at our site made it unrealistic to count individual items, and scales that had originally been used to weigh debris were designated for other needs on the island. As a start, we suggest a nation-wide joint effort or network to share methods, data, curriculum, and outcomes in order to develop a unified voice, increase awareness, and lead to policy changes. This has been effective in addressing marine debris in other nations (Ocean Conservancy, U.S.; Earthwatch, Australia). While our program is certainly not the only effort to address marine debris in Indonesia, regular, systematic monitoring provides valuable educational opportunities, connections with environmental role models and researchers, and publicly gathered data (Chawla and Cushing, 2007; Bonney et al., 2009). Expanding this type of outreach can enhance marine debris awareness and science education in Indonesia. The outreach program described in this paper was exempt from ethics approval as it did not involve any research on human subjects. An ethics approval was not required as per the guidelines of the ethics committees of the University of California and Hasanuddin University, national guidelines and regulations at the place where the research was conducted. Parents/legal guardians of participants in the outreach program gave informed consent. All authors contributed to data collection, program implementation, and revisions. RA-R, HL, SS, WU, DT, and SW designed survey methods. CS, JA, and SW managed and analyzed data. CS, JA, SH, BJ, GN, ES, DT, and SW wrote manuscript. All authors are listed alphabetically after CS. The project was supported by the Partnership for Enhanced Engagement in Research grant from the U.S. Agency for International Development (#2-319 to RA-R), a Graduate K-12 grant (#0841297) from the National Science Foundation and a SEED grant from the University of California at Davis (to SW). The reviewer AS and handling Editor declared their shared affiliation. We thank the numerous students and educators who participated in the program in the United States and Indonesia. S. R. Artika, J. M. Bean, B. S. Cheng, R. E. Crafton, K. Dubois, N. T. Handayani, J. Hollarsmith, L. M. Komoroske, E. Lisdayanti, S. Mangando, J. Miller, A. A. Wirawan, and Ridwan provided additional assistance. Mars Symbioscience provided logistical support. Glaeser, B., and Glaser, M. (2010). Global change and coastal threats: the Indonesian case. An attempt in multi-level social-ecological research. Res. Hum. Ecol. 17, 135–147. Gupta, K. (2011). “Consumer responses to incentives to reduce plastic bag use: evidence from a field experiment in urban India,” in South Asian Network for Development and Environmental Economics (SANDEE) Working Paper No. 65-11 (Kathmandu). Kimball, L. A. (2001). International Ocean Governance: Using International Law and Organizations to Manage Marine Resources Sustainably. Gland; Cambridge: IUCN. McIlgorm, A., Campbell, H. F., and Rule, M. J. (2008). Understanding the Economic Benefits and Costs of Controlling Marine Debris in the APEC Region (MRC 02/2007). A report to the Asia-Pacific Economic Cooperation Marine Resource Conservation Working Group by the National Marine Science, Centre University of Coffs Harbour. UNEP (2009). Marine Litter: A Global Challenge. Nairobi. UNEP/NOAA (2012). The Honolulu Strategy: A Global Framework for Prevention and Management of Marine Debris. Copyright © 2018 Sur, Abbott, Ambo-Rappe, Asriani, Hameed, Jellison, Lestari, Limbong, Mandasari, Ng, Satterthwaite, Syahid, Trockel, Umar and Williams. This is an open-access article distributed under the terms of the Creative Commons Attribution License (CC BY). The use, distribution or reproduction in other forums is permitted, provided the original author(s) and the copyright owner are credited and that the original publication in this journal is cited, in accordance with accepted academic practice. No use, distribution or reproduction is permitted which does not comply with these terms.